Sakhri a village of 35 households is located 346 kms from Shillong in East Jaintia Hills district having coordinates: N-25 08’ 28.6”, E-092 24’ 43.2” along the Shillong-Agartala National Highway. It takes about an hour on foot to reach the village as it is not connected by road. 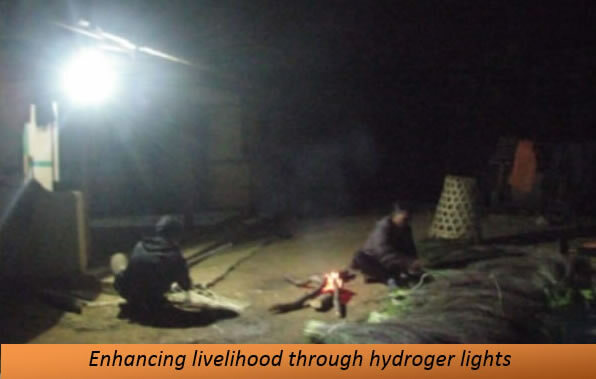 A 3Kw hydroger was installed in convergence with the Meghalaya Rural Development Society (MRDS) from 29thJan - 4th Feb ‘2013. The installation was a success due to the active participation of the villagers and MRDS members. In-situ training was given to them in all facets of Hydroger installation.